We’ve had our strong disagreements with efforts to get more girls interested in science. While some feel the effort should not be made to appeal to girls at all (not out of chauvanism, but out of the idea that there should be no consideration for gender learning & play processes) our main issue has often been with the very poor execution of said efforts: from the utterly disastrous European Commision’s ‘Science, Its a girl Thing’ video to several science toy companies very poor efforts to appeal to girls by presenting them with inferior versions of boy’s science toys. The key problem in the past has been a lack of innovation. Slapping a pink label on a science kit, putting a pretty, pretty princess on the box, disguising the kit as something else besides science are all things that have been tried before and hardly even qualified as ‘innovation’. But now at least some efforts are being made to address the issue. Goldie Blox is a case of innovation that would not exist without the internet. The company is a start-up, not a major toy company, and was funded via kickstarter, the famous home of armchair venture angel investors. The company was conceived by Debbie Starling, a Stanford engineer who has made it her life’s work to tackle the gender gap in science & engineering. Starling’s idea was simple: do some actual research on how girls play & learn and then design a product that would be educational and fun. The research found that girls tend to ‘play with purpose’. In other words, they want an end to their means. While boys may take a construction toy and start slapping pieces together, girls prefer to have some reason to do so. (Note: we are grossly, grossly overstating the research here). To that end the character of Goldie Blox was invented. 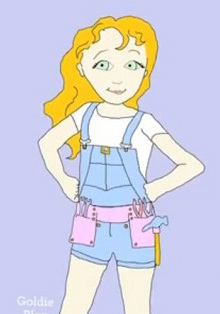 Unlike the blonde princess of Be Amazing’s girl toy line or a Barbie Doll, Goldie has overalls and a tool belt. For a toy with purpose, a story was made for the toy to be demonstrated: Goldie has a pet dog named Nacho (along with a lot of other friends as we shall see). Nacho wants to chase his tail, and Goldie wants to help out. To that end Goldie develops the Spinning Machine. While children work with the Spinning Machine they learn a lot of basic concepts about a system known as a belt drive, which is used in all sorts of machinery. As indicated from the title, this is expected to be part of a whole series of science/engineering toys not merely aimed at girls, but designed for girls. Time will tell if it is a success but so far the pre-launch hype has definitely garner attention. Do you want to buy Goldie Blox and the Spinning Machine? New Q-Men, Really, really small this time! Q-Men! They are the little flexible people made of bendable plastic. That alone isn’t so much but when you add in the fun of them having little high-powered magnets in their feet and hands it becomes quite a fun little toy, actually. These little guys are half the size of a Mini-Q-man. Just 1″ tall! They are sold in packs of 4 for just $9.99! Incredible! But if you want something a little more unusual, how about a 4 pack of Glow-In-The-Dark Super Mini Q-men? These are the same size as the regular Super Mini-Q-Men, except that they glow in the dark! You get two blue and two green glowing super Mini-Q-Men. Want to buy other Magnet Toys? Tuesday. It is time for lazy. So here are a couple of time lapse movies we made. And we also have an artsy time lapse of the Drinking Bird we keep in the store window. Alternative sources of energy are a big concern these days, and in the classroom teachers have desperately searched for ways to teach new methods of generating electricity and other power sources. Most of their usual sources have come up short: a solar kit here, a wind energy kit there, but nothing that really engages the full spectrum of alternative energy generation. The kit is large enough and involved enough for an entire student program on alternative energy. The kit can be combined with the Horizon Renewable Energy Monitor so that results can be shown on a computer screen. This panel is sizeable and can generate enough energy to power some LEDS, break water into hydrogen (more on that later) or drive a fan (the one in the lower right in the above picture – the tall thing is a wind turbine). Experiments students run have them not only powering these items but also testing the angle, heat, and shade on the ability of the solar panel to generate power. The next crucial part of the Renewable Energy Experiment Kit is the Electrolyzer Module. This Fuel Cell can be hooked up to the LED module or the Fan and will power them by converting the hydrogen into electricity. The Fuel Cell is one of the more interesting forms of alternative energy generation and the Renewable Energy Experiment Kit manual doesn’t fail to follow up on the subject. Various forms of hydrogen generation are discussed, along with the future of hydrogen generation, and much more. The Wind Turbine uses wind the generate electricity. Like the solar panel it can be hooked up directly to the fan or LED panel, or can be attached to the Electrolyzer Module to generate hydrogen fuel. The windmill itself is very adaptable, with the students being able to adjust the pitch angle of the fan blades, as well as the number of blades to determine which is the most efficient method of generating power. To say this description of the kit only scratches the surface is actually a bit of an overstatement. There are many things for students to study and learn, and loads of experiments to do. The kit is compatible with other Horizon Kits, so for example the hydrogen generated can be used to power the H-Racer Hydrogen Car or the Fuel Cell Science Kit. Want to buy the Horizon Renewable Energy Experiment Kit? Interested in other Alternative Energy Kits and products? So you got yourself a telescope. Great! But you couldn’t afford all those computerized doo-dads that everyone else has on their telescopes and like you see on that one telescope shown in the SkyMall catalog. Boo..wait, you don’t need that! You’ve got a Smart Phone! Now Smart phones are no substitute for experience with a telescope, but they can make your life a little easier during an observing session. This is great for identifying what is in the night sky, for finding out where deep sky objects will be in comparison to stars you can actually see and so on. 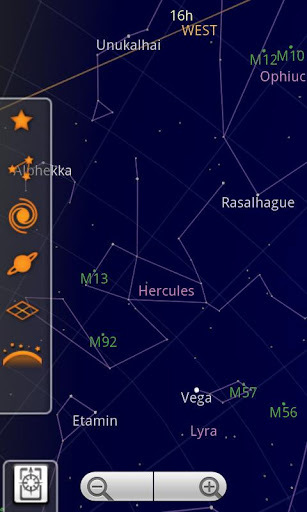 SkEye is very much like Google Sky Map except it has a few other features, main that it has the potential to act with your telescope as an object finder! It is somewhat less intuitive that Google Sky Map, starting off with the Red light setting on (astronomers use red light to night disturb their night vision). Some of the setup is a little bit more involved, and we can’t see. It also is not automatically set up to follow your path as you move it around. On the plus side, at least for more experienced astronomers, you can use SkEye to turn your telescope into a push-to telescope. The process involves ‘attaching the phone to your telescope’, which is a bit on the vague side. Telescope simulator is not free. It costs $1.39 as of this writing. Its purpose is to give you a realistic idea of what you will see through any telescope. You can adjust the aperture, eyepiece size or pick from 50 popular designs. 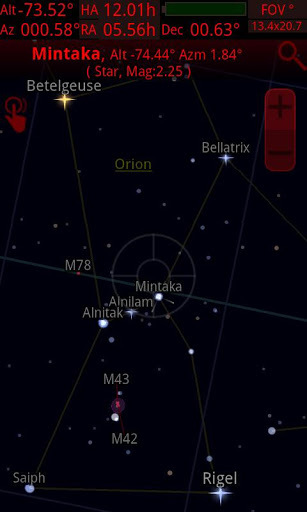 The reason for this app is so you can see why there are differences in telescopes. As we like to tell folks buying a telescope: Any telescope will let you see Saturn’s Rings, but the question is how good do they look? This app hopes to answer that question. By our own tests the appearances were accurate. Of course any such app will lack the real life effects of turbulence, floaters in your eye, and other unpredictable effects, but this is only a simulation, after all. The major disadvantage is that there are a limited number of objects to view in the app. Verdict: Planning on buying a telescope? Probably worth it. Otherwise not needed. There are actually quite a few apps like this, but this seems to be the most popular one. That’s pretty much what it does. 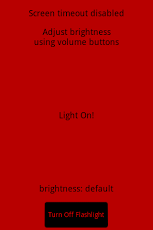 You can adjust the brightness of the light by using the volume buttons on your phone as even a red light that is too bright. It seems to work well. The bad stuff: Ok, so if it is just a flashlight app, why does it need to access so much stuff on my phone? Does having access to my contact list make it a better flashlight? This stuff is a concern. Verdict: Works as advertised, but be wary of its intrusive nature. There are other red flashlight apps out there. Its Spring! And that means the weather is nice enough to go fly a kite! Kites area big warm weather toy for us, so we are sure to add a few to our line every spring. First up we have a couple of new solid color Delta Kites. Deltas are probably the easiest kites to fly short of the Hi-Fly designs. These Deltas are large – 56″ wide and 22″ tall. We carry them in Purple and Yellow solids. They include 100′ of #22 line and a handle. This dinosaur of old is 52″ wide and like all of our other kites is made of ripstop nylon. It is easy to assemble and uses fiberglass rods. This Biplane Kite has a wingspan of 30″ and is ready to fly out of the box. Get out there and go fly a kite! Want to buy kites from Spectrum Scientifics? Testing the iPhone 60X Microscope Attachment. 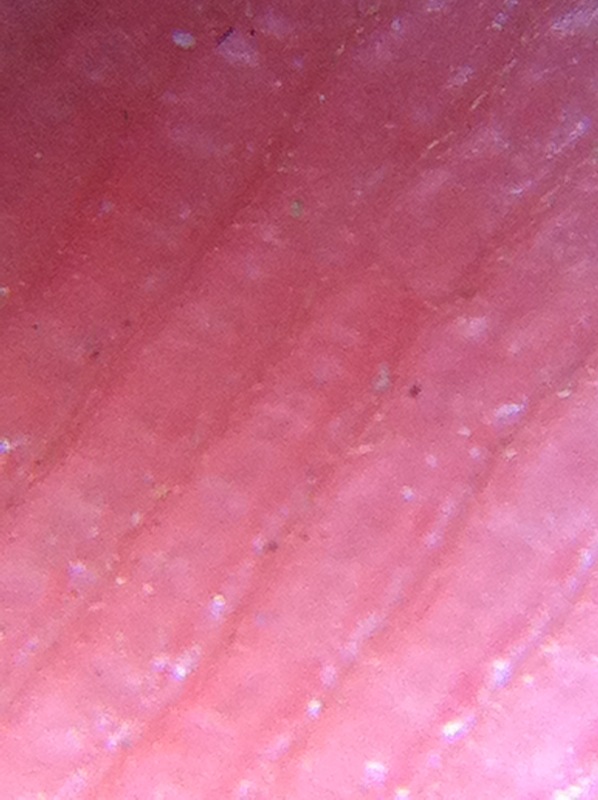 Recently we added a little gadget that turns an iPhone into a 60x Digital Microscope. Well, we wanted to make certain this item actually worked, so we got a friend with an iPhone 4 (this will not work with the newer, larger iPhone 5) and gave it a trial run. First up, the microscope consists of 2 parts – the actual microscope and the frame that attached to your iPhone. Now here is the interesting thing: The microscope part will actually work on its own. You do not need to attach it to the iPhone if you just want to take a quick glance at something. It works just fine on its own as a handheld microscope – a bit tricky to focus but its still works just fine. The frame must go over the iPhone, which means that you will need to remove any other cases or very thick stickers/attachments from your iPhone. If you’ve made your phone look like it was attacked by a BeDazzler you might have issue with the frame. Before attaching the frame, however, it is probably best to attach the microscope to the frame first. We tried it the other way ’round and it was a little awkward. In any case the microscope threads into the frame like so. There is one issue with threading the microscope into the body: The natural tendency is to grab the outside frame that attaches the light to the microscope and turn the microscope that way. Unfortunately, the attachment is free floating so that you can adjust the position of the light. This means you will be spinning the light, but not threading the microscope into the frame. It is best to pull the light out so that some of the shaft of the microscope is exposed and thread the microscope in using that instead. Once you attach your microscope & frame to the iPhone it should resemble the top image above. you are now ready to shoot. Click on your camera app and get started. First thing you mat notice is that without any zooming you will see a lot of the microscope’s mechanism in the frame. This can be solved with a simple bit of zooming using your fingers until you have a better close-up. The camera in the iPhone is plenty powerful enough to handle this. Now you need to focus – your iPhone camera will do a lot for this but you do have to make a few adjustments mechanically by sliding the light hold out. All this really does physically is move the target subject away from the microscope’s lens. The microscope has two ways to light the subject, since the iPhone’s flash will be covered by the microscope frame. First is a pair of very bright white LEDs. This is advertised as a counterfeit fighting measure, but may also be useful for geological, chemical, and biological purposes. That is a human finger tip, magnified 60x. Focus was a little tricky and we depended on the iPhone to do most of it. Some adjustment for positioning was needed however. The light was also very powerful and tended to wash out one side of the image. We did not try it without the flashlight so we are not certain how the iPhone’s camera would work adjusting for a low-light situation. 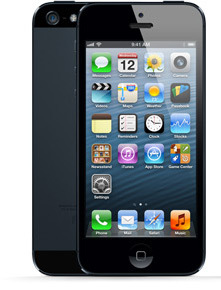 At present, we only carry the model that fits the iPhone 4 and most other older models of iPhone. If we have success with this model we may add other microscopes to the line to cover the iPhone 5. Android models may also be added but their rapid changes in both body size and camera position may limit the models covered. Want to buy the iPhone 60x Microscope attachment? Want to buy Digital Microscopes?